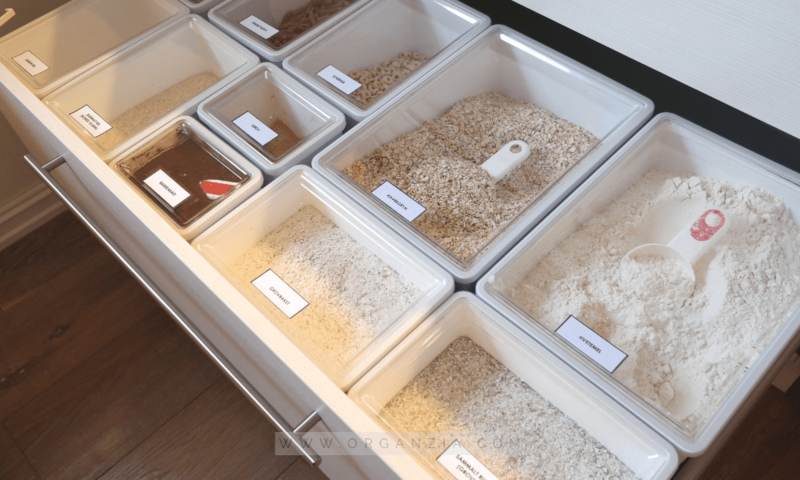 How To Get An Organized Spice Drawer, Even If It’s A Mess! 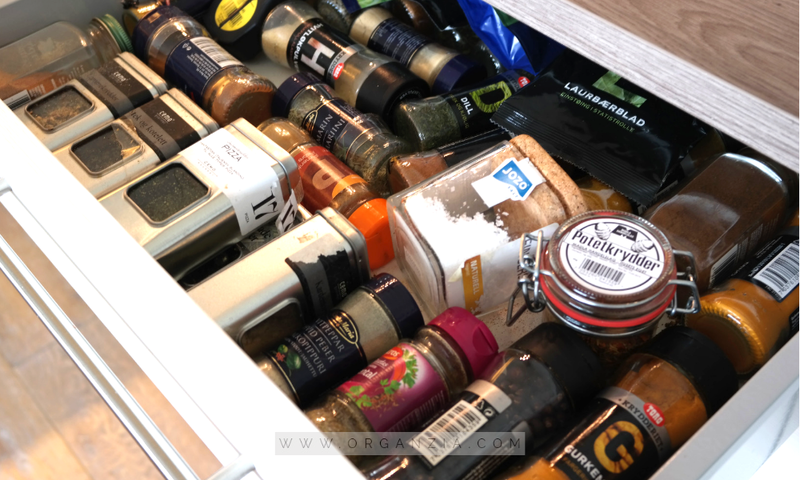 How my spice drawer went from a total mess to the most organized spice drawer EVER! 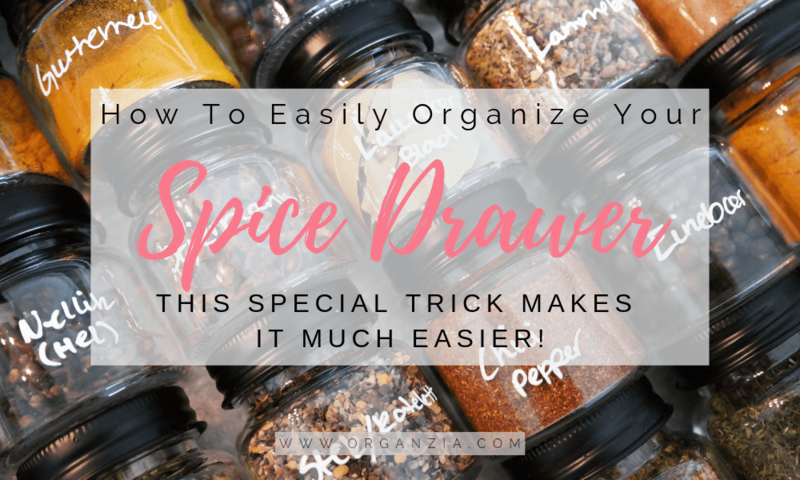 Today it’s time to talk about how to easily get that organized spice drawer! And to be honest my spice drawer has been needing some serious TLC for quite some time now! I love cooking, and I love food with lots of flavors (Asian and Indian food is just so yummy!). I often end up buying a lot of new spices I find in the store, online, and while on vacation. 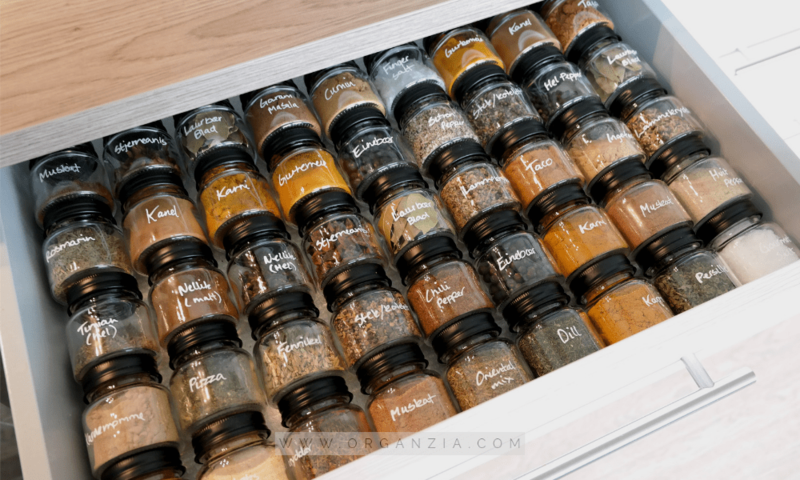 Where do you start if you want an organized spice drawer? And with so many different holders, tins and jars my spice drawer is just total mess. It’s so bad that I’m kinda embarrassed to show you guys the before picture, BUT I like to be honest and tell it as it is. So have a look at the before picture down below. It’s just a beautiful mess of way too many different kinds of jars, tins, and boxes. It also really needs a good cleaning because it’s just spices everywhere. You could say It looks like a nightmare kind of spice drawer, yikes! I knew I had to do something, enough was enough! So I searched, planned and found inspiration( Pinterest is the best!) to how I could get the organized spice drawer I really wanted. 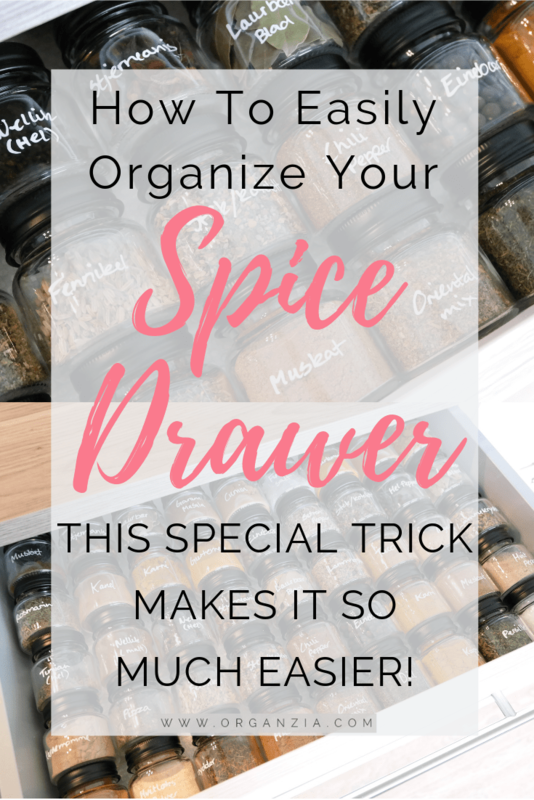 This is how you get an organized spice drawer, once and for all! If your drawer needs to be washed, wash it thoroughly and let dry. Cut the liner according to the size of your drawer, and place it in your drawer. Adjust and cut it some more if you see it’s not fitting nicely into your drawer. When that’s all done, all you need to do is to fill up your new glass jars with your spices, and write down what spices are inside the jars. And if you’re like me and need to know the “use by date”, you can write this detail on the bottom side of the jars. This is a fairly easy project, just a bit time-consuming. Please make sure you measure your drawer before you buy the small glass jars. Just so that you’re actually sure they’ll fit nicely in your drawer. I bought my glass jars at a local shop nearby, but you can also find similar glass jars here. And for an extra organized spice drawer, feel free to organize the spices alphabetically. I didn’t to that now, but I sure might as well someday! I’m actually NOT joking, to be honest, I feel the need to go and do it right as we speak! My secret weapon in this project is my favorite all-around marker from POSCA. I’ve tried a couple of different markers, but this is my favorite go-to marker for so many types of creative projects. 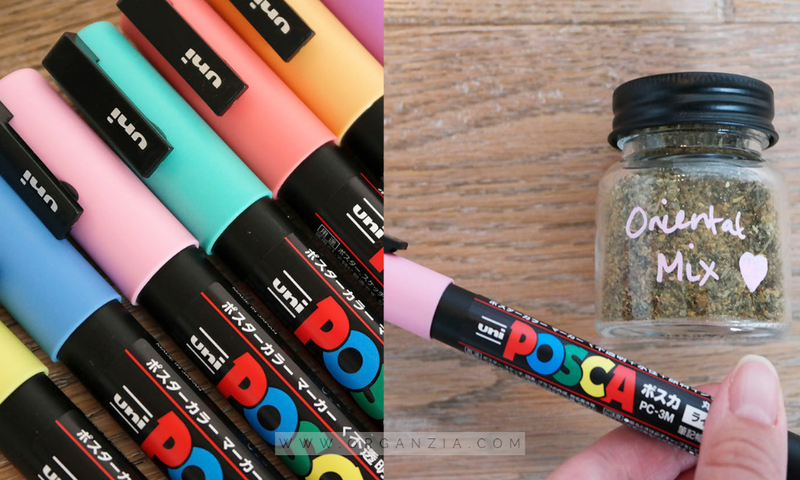 I love how versatile this marker is and that it can be used on so many different surfaces including glass, stone, wood, ceramic, plastic and even fabric! This time I used the white POSCA Marker. It’s really easy to use, you just need to shake it well (with the cap on..) Press the tip down on the surface you’re writing on, and write whatever you want! And what I loved about using this marker writing on these glass jars, is that the text can easily be removed just by using a damp cloth. The text goes off really easy just after you write the text, but even after days and weeks, you can still just use a damp cloth and just rub gently to remove the text. I considered using labels, but for me, I think it’s much more practical to just use a marker. Then I don’t need to remove the label if I need to wash them or want to use the glass jars for something else. 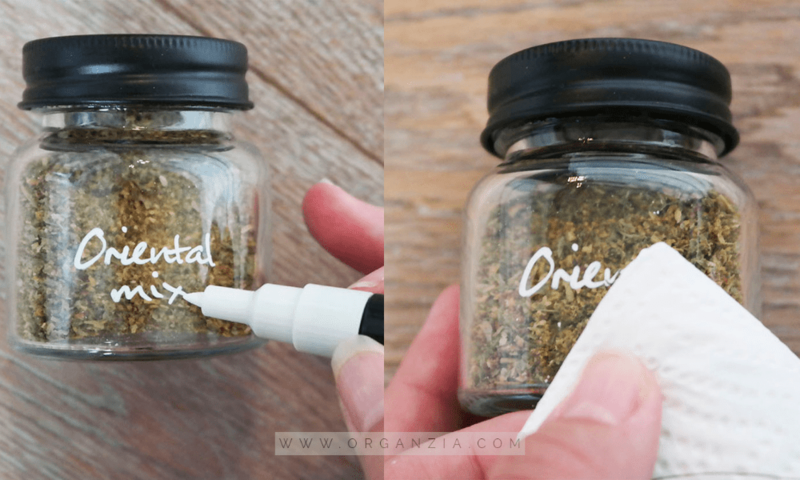 So when you’ve written on your glass jars, if one spice jar is empty you might want to fill it with a totally different spice. You can easily just clean away the text and reuse the same jar. I love, love that! Feeling adventurous? 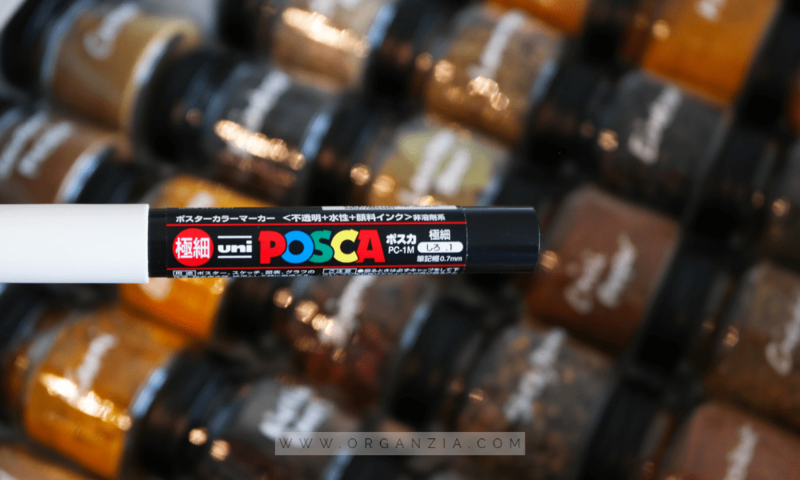 Try using one of the other markers from POSCA. I love pastels and especially pink, so I had to get this marker set as well. I’m so happy with this purchase, been using them for all kinds of different projects lately. There are just so many pretty things you can make with these! I Will for sure be showing you more cool projects using these, coming soon! Is it crazy to feel genuinely happy every time I open up this spice drawer? Might be! But I honestly love how this project turned out. It’s just so pretty, and I wish all my kitchen drawers could look like this. Would so love that! But got some work to do to get there though.Well, we need goals right? I’m just crazy about kitchen organizing hacks. Now, who doesn’t want a beautifully organized kitchen right? Be sure to check out my most shared post (now pinned over 25 000 times on Pinterest!) how I finally organized my kitchen drawer here. And for even more how to organize your kitchen inspiration, also check out my top 6 tips for an organized kitchen here. Lego Instruction Manuals, How To Easily Organize Them! Confetti Wall Art, The Cutest DIY Project To Try Now! Budget Friendly Christmas Decor Items – All under $10!